Hello, hope all is well. Perhaps you can clear something up. I read an article awhile back stating that the Niger (red tooth) trigger was a distant relative of the dolphin. I thought I saved the article but can not find it and it came up in a forum I am a member and everyone is thinking I am crazy as dolphin are mammals and the trigger is a fish. Have you heard of which I speak? <Leon, you are quite right. 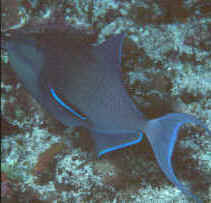 Triggerfish are fish; Dolphins are mammals. They are both chordates of course, and more specifically, both are vertebrates. So they have much in common. But their lineages diverged some 400 million years ago, and Triggerfish are far more closely related to bony fish such as Salmon, Goldfish and Perch than they are to Dolphins. See why it's called "Red Tooth?"